500 Words You Should Know will inspire the reader to use uncommon words in their correct context, utilize the English language to its full potential, and test themselves on the words they think they already know. 'This "essential cornucopia" aims to inspire you to use uncommon words in their original contex'- Bookseller Ever wanted to ameliorate your atavistic lexicon, engage in a little intellectual badinage or been discombobulated by tricky diction? 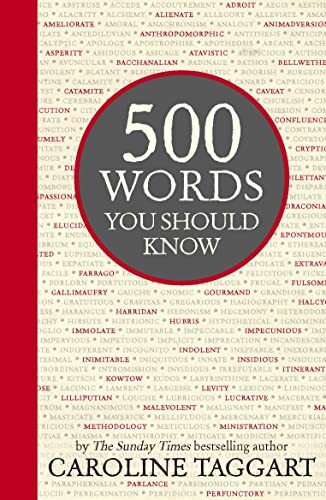 500 Words You Should Know has you covered. This book will inspire the reader to use uncommon words in their correct context, utilize the English language to its full potential, and test themselves on the words they think they already know. This is a book for the appreciator of correct usage, and contains words you thought you knew (decimate, caveat, nemesis), words you should know (euphemism, diatribe, tautology), and just a few that you might want to know (peripatetic, shibboleth, callipygian). Arranged thematically, each word is dissected, with a brief explanation of etymology, historical and modern usage, allowing you to fully understand and effectively employ the word in its proper context. For those interested in everything this eclectic language has to offer, who wish to celebrate its majesty and depth, this veracious cornucopia of knowledge will have you confabulating with the literary cognoscenti in no time.